I’ve had the pleasure of sailing aboard the Celebrity Equinox – the second installment (launched in August 2009) of Celebrity’s much-lauded “Solstice class” of ships (the flagship of the line, Celebrity Solstice, debuted in 2008; a total of five sister ships in all, with only slight color scheme and dining venue alterations, are set to be out on the market by 2012) – over the last week, and after seven days and nights of enjoying the high life on the high seas, I’m pleased to report that Celebrity’s latest endeavor truly lives up to the hype. The 2,850-passenger Equinox touts a modern and sophisticated design that affords all of the bells and whistles of big-ship sailing, yet allows for such excellent passenger flow (thanks to an intuitive layout and countless diversions) that the surprisingly intimate experience onboard is more akin to that found upon a luxury vessel just a fraction of its size – and better yet, is being offered at a fraction of the cost. Celebrity’s Solstice class has succeeded to raise the bar on the premium cruising market and I can confidently predict that it’s going to give the traditionally defined luxury cruise lines a real run for their money. Primarily, the Equinox, like its predecessor, the Solstice, has been making waves for its innovative ship-wide design. Sleek and spacious staterooms (that are 15 percent larger, on average, than previous Celebrity ships) reflect a design scheme that was influenced by a panel of five well-traveled women: Expect ample storage facilities and thoughtful touches in the bathroom like no-fog mirrors and a footrest in the shower to comfortably shave legs. An innovative, interactive, Apple technology-powered TV network in each stateroom offers applications to book excursions, order room service, and easily keep tabs on account balances. Staterooms range in size from the duo of super-luxury Penthouse Suites (1,291 square feet) to the most basic inside cabins (from 183 square feet); 85 percent are equipped with private, extra-deep verandas. Spa buffs should be on the lookout for the line’s new AquaClass staterooms – these 130 units are dedicated to spa pampering and outfitted with special in-room spa amenities, unlimited access to spa facilities, and exclusive dining privileges at the spa cuisine restaurant, Blu. Foodies will be enticed by a choice of 10 restaurants onboard Equinox, anchored on the two-story Silhouette, the classic main dining restaurant centered on a glass wine tower and touting an effervescent champagne theme. Also expect a casual buffet, spa café, a gelataria, coffee house, crêperie, and a trio of well-serviced and more intimate specialty restaurants (requiring a supplementary fee): Silk Harvest (Asian); Tuscan Grille (Italian); and Murano (Continental). More than a dozen bars and lounges offer ample opportunity to wet your whistle – don’t miss the martini flight served atop the frosted bar of the Martini Bar, wine tasting via pneumatic dispensers at Cellar Masters, or a chance to sample experimentally infused cocktails (with ingredients like liquid nitrogen) at the Molecular Bar. The Equinox offers everything you’ve come to expect from big-ship sailings – a complex of pools and Jacuzzis (including the tranquil, adults-only indoor pool and whirlpool area, the Solarium); casino; nightclub; variety of shops (a whopping 18 in all); a duo of theaters; Internet lounge (note that though WiFi is offered in staterooms, services were off-network more than they were on during my sailing); kid and teen centers; and a spa, salon, fitness center, and a basketball court count among its offerings. 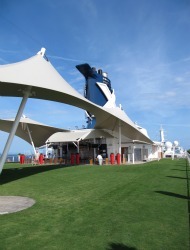 A few of its more innovative diversions include the Hot Glass Show, which allows guests to view glassblowing artisans at work, thanks to a partnership with The Corning Museum of Glass; the half-acre-plus Lawn Club, where a manicured lawn is primed for sunbathing or to putt some golf balls around; and even self-guided iPad tours of the ship’s art collection. Expect daily activities that feature interactive experiences with crew (like poker nights), dance lessons, expert speakers on local ports, and various musical and theatrical performances. The Equinox summers in Europe, and winters in the Caribbean; rates for 10-night sailings start from $799. To book, visit www.celebritycruises.com.